The “European perspective” is key concept for integrating western Balkans into EU. The main carrot for ordinary people during this millennium has been visa-free travel after some 17 years of isolation. On 15th July 2009, the European Commission submitted its proposal on visa-free travel for citizens of Western Balkans countries. After a non-binding opinion of the European parliament on the EC proposal the Council comprising EU interior ministers will take the official vote and at best case free travel to Schengen area could be possible January 2010. But not for all! European perspective will be true only for some when visa ban still will be existing for some countries or even to some ethnic groups inside a country. Instead of connecting people of western Balkans with western Europe the EC proposal will divide again people according their nationality or location. From EU’s side the reason for division is seen technical related to common standards; from western Balkan’s perspective the reasons for division can be seen political or even related to religion. The Schengen wall was erected against most of the Balkans during the early 1990s, when the breakup of former Yugoslavia created an image was ongoing and bloody wars were spreading from Croatia to Bosnia and Kosovo. Before breakup the citizens of Yugoslavia enjoyed relatively free travel possibilities if compared to rest of countries in central and eastern Europe. After visa ban and trade embarco only the most criminal elements found it easiest to evade the regulations. no change of the status for Albania and Bosnia and Herzegovina, which remain on the black list since they have not fulfilled all conditions, but the Commission “intends to propose transferring them to the positive list as soon as they have fulfilled the necessary benchmarks”. Bosnia-Herzegovina is an international creature established by Dayton Agreement on 1995 which split Bosnia into two semi-independent entities – the Serb Republic and the Muslim-Croat Federation. Three ethnic groups – Croats, Serbs and Bosniaks – are trying to lead state together and separately. Entities are united by weak central institutions, while at same time administration is quite heavy loaded with some 170 ministers and whole system is supervised by international presence. Most Bosnian Croats already have Croatian passports and since Republika Srpska residents can apply for and obtain Serbian passports, the EC proposal for Bosnia would affect the majority of Bosniaks and those Bosnian Serbs, Jews and others that live in the Muslim-Croat Federation. The EU’s message now weakens already non-existent national identity and opposes EU’s earlier multi-ethnic ideals. The Kosovo case is dividing international community as well EU. EU started its huge rule & law mission late 2008 under UN umbrella. Besides UN/UNMIK and EU/EULEX there is also other players twisting arms who is leading the international protectorate. There is European Union High Representative who simultaneously leads International Community Office wondering his role, same time Nato-troops (KFOR) tries to keep ethnic tensions moderate, OSCE do not know its role nor length of its mission’s mandate in Kosovo, EU delegation office, few influential foreign liaison representatives and of course sc. Kosovo government based to local tribes. It shows amazing creativity to establish this kind organizational nightmare in one tiny province and more amazing is that after nearly nine years of international administration and capacity building and squandered billions of Euros both the administration and the situation on the ground are beneath all criticism. According the new report made by Minority Rights Group International (MRG) gives a bare picture about worsening situation of minority rights in today’s Kosovo. Instead to return to their homes after ethnic cleansing implemented by Kosovo Albanians after Nato intervention 1999 minorities are beginning to leave Kosovo, because they face exclusion and discrimination. This negative process is happening in international protectorate where EU is implementing one of its biggest civil crisis management operations and once again demonstrates the huge gap between high flown ideas, aims, programmes and statements made in Brussels and their implementation on the ground. In the letter to the EU, the NGOs state that Kosovo`s exclusion from the visa-liberalisation process threatens to transform Kosovo “into a ghetto without any way out”. The head of the Club for Foreign Policy and co-signatory of the letter, Veton Surroi said that Kosovo’s citizens would be further isolated by the EU’s decision, hindering the integration of the country. “Since 1999 Serbia has not had the possibility to make on the spot verifications regarding persons residing in Kosovo under UNSCR 1244/99 … the Commission and the Member States experts were not in a position to verify the issuing of breeder documents and the integrity and security of the procedures followed by the Serbian authorities for the verification of the correctness of data submitted by persons residing in Kosovo when applying for new Serbian biometric passports”. For one hand one can see some European hypocrisy towards the region as in both cases – Bosnia-Herzegovina and Kosovo – EU and international community have guided and supervised these regions towards “European standards”. So has EU failed with this task as those countries without outside supervision are getting visa-freedom earlier? There is also well based arguments that the EU is isolating three mainly Muslim European states/regions – Albania, BiH and Kosovo – and Turkey as some in the EU fear the presence of such a large, Muslim community inside traditionally Christian Europe. Of course EU denies political aspects and highlights only the technical ones but from Balkan perspective the impression can differ. Be the proposal based on political or technical reasons the outcome now however is that while visa-freedom sure is good step forward for (FYR) Macedonia, Serbia and Montenegro the Commission’s proposal same the gulf between ethnic groups in Bosnia-Herzegovina and Kosovo will deepen further. Srebrenica case should finally put into its political context, for media it would be useful to see the case as part of lobbying/marketing to achieve political aims. It seems that the town was deliberately sacrificed by the Presidency of the Bosnia and the Military High Command in order to encourage NATO intervention. From the the U.N. Secretary General’s 1999 Report on Srebrenica, it emerges that the idea of a “Srebrenica massacre” was planned at a September 1993 meeting in Sarajevo between Bosnian Muslim president Alija Izetbegovic and members of his Muslim party from Srebrenica. On the agenda was a Serb proposal to exchange Srebrenica and Zepa for some territories around Sarajevo as part of a peace settlement. “The delegation opposed the idea, and the subject was not discussed further. Some surviving members of the Srebrenica delegation have stated that President Izetbegovic also told them he had learned that a NATO intervention in Bosnia and Herzegovina was possible, but could only occur if the Serbs were to break into Srebrenica, killing at least 5,000 of its people.” So from here are the numbers originating, sadly the western mainstream media went to this propaganda trap. * Was the secret deal made about Srebrenica (Bosnian Government and the Bosnian Serb party, possibly with the knowledge of one or more Contact Group States, had an understanding that Srebrenica would not be vigorously defended by the Bosniacs in return for an undertaking by the Serbs not to vigorously defend territory around Sarajevo. The capture of Srebrenica made it easier for the Bosniacs and Serbs to agree on the territorial basis of a peace settlement. The result of the tragedy in Srebrenica contributed in some ways to the conclusion of a peace agreement — by galvanizing the will of the international community, by distracting the Serbs from the coming Croatian attack, by reducing the vulnerability of UNPROFOR personnel to hostage-taking, and by making certain territorial questions easier for the parties to resolve). During ICTY trial of Mr. Karadzic there has been discussion if the Holbrooke-Karadzic deal is existing, like the accused has said ( Karadzic claims that his going into hiding formed part of a deal with Holbrooke, which included his withdrawal from public life in exchange for not being arrested). However more interesting secret deal is related to international peace settlement and the role which Srebrenica plays in that context. 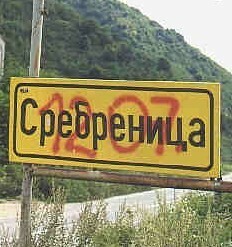 One theory is following: Bosnian Government and the Bosnian Serb party, possibly with the knowledge of one or more Contact Group States, had an understanding that Srebrenica would not be vigorously defended by the Bosniacs in return for an undertaking by the Serbs not to vigorously defend territory around Sarajevo. The capture of Srebrenica made it easier for the Bosniacs and Serbs to agree on the territorial basis of a peace settlement. The result of the tragedy in Srebrenica contributed in some ways to the conclusion of a peace agreement — by galvanizing the will of the international community, by distracting the Serbs from the coming Croatian attack, by reducing the vulnerability of UNPROFOR personnel to hostage-taking, and by making certain territorial questions easier for the parties to resolve? The actions of ruling Bosnian (Muslim) party (SDA) and its leader – Alija Izetbegovic – during Srebrenica events on July 1995 seems to confirm that a deal about the fate of town had been made earlier. Author John Schindler, a professor at the U.S. Naval War College and a former National Security Agency analyst, concludes in his book “Unholy Terror: Bosnia, Al-Qa’ida and the Rise of Global Jihad” describes how local Muslim leaders begged Sarajevo for assistance. None came, and the town fell to the Serbs within five days. Schindler proves that Bosnian Army signals intelligence had advance warning of a Serb offensive, and did nothing, and that even when armed Bosnian soldiers taking with them civilians (and not the simple unarmed masses that the Western media tacitly alleges) tried to contact their kin, no help came. Shockingly, on the morning the town fell to the Serbs, “there was a meeting of the (SDA) party leadership and the top officers of the General Staff in Sarajevo; the enclave wasn’t on the agenda. The pre-Srebrenica events are often forgotten. There was also a long history of atrocious Bosnian Muslim violence and treachery perpetrated against Bosnian Serbs leading up to the regretable events of 1995. The most cruel crimes were committed by the 3rd Corps 7th Muslim Mountain Brigade, to which were subordinated foreign Muslim fighters, also known as mujahedeen, who came from Islamic countries through Osama bin Laden’s terrorist network. This sc. “demilitarized safe area of Srebrenica” served as the safe haven to this brigade lead by Bosnian Muslim leader of Srebrenica forces Naser Oric and his people went from that almost unconquerable place in the series of atrocious attacks on the near-by Serbian areas. Author John Schindler, concludes in his book “Unholy Terror: Bosnia, Al-Qa’ida and the Rise of Global Jihad” that the facts were incompatible with the standard version of events in Srebrenica. Schindler points out that Izetbegovic government had been using “safe zone” to stage attacks on Serbs in neighboring villages for three years and over 3,000 Serbs including 1,300 civilians were massacred by Muslims in Srebrenica municipality, “in many cases butchered, tortured, mutilated, burned alive, or decapitated. The main figure often ultimately responsible was the Bosnian Army’s local commander, the exceptionally brutal Naser Oric, who used Muslims as human shields against the Serbs, and who eliminated enemies real or perceived, even within his own units. Oric delighted in showing Western journalists his home-made videos depicting the beheadings of Serb prisoners (p. 229). However, even as talk of a Serb offensive was growing in early 1995, Sarajevo’s local strongman was inexplicably recalled, leaving Srebrenica-area Muslims without effective leadership: “in April, Oric and his senior staff left the town under cover of darkness, headed for Tuzla, ostensibly to take a command training course. He never returned (p. 230). Even today’s headlines are describing Srebrenica with slogan “worst civilian massacre in Europe since WWII”, there is also many arguments about political PR game behind exaggerated death numbers, misrepresentation of early reports and manipulated pictures. Probably a massacre happened but maybe not like that picture which main stream media has offered. Are we finally getting more wider picture about connections between numbers (Srebrenica figure game), reports (as mean of one-sided propaganda) and political PR marketing considering events in Balkans during 1990s? One of the most important propaganda lies of the 1990s featured the Serb-run Trnopolje camp, visited by Britain’s ITN reporters in August 1992. These reporters photographed the resident Fikret Alic, showing him emaciated and seemingly inside a concentration camp fence. In fact, Fikret Alic was in a transit camp, was a sick man (and was sick with tuberculosis long before reaching the camp), was not in any way representative of others in the camp, and was soon able to move to Sweden. Furthermore, the fence was around the photographers, not the man photographed. But this hugely dishonest photo was featured everywhere in the West as proving a Serb-organized Auschwitz, was denounced by NATO high officials, and helped provide the moral basis for the creation of the ICTY and its clear focus on Serb evil. The message went through western mainstream media – it was easy to believe that the Bosnian Serb Army organized and executed a premeditated slaughter of 8,000 unarmed Bosnian Muslim civilian males; the case has become a crucial element in portraying Serbs, collectively, as genocidal aggressors. This picture has stayed stabile in spite of evidences that Izetbegovic’s own party, the SDA, specialized in staged mortar attacks on civilians which were then blamed on Bosnian Serb forces. 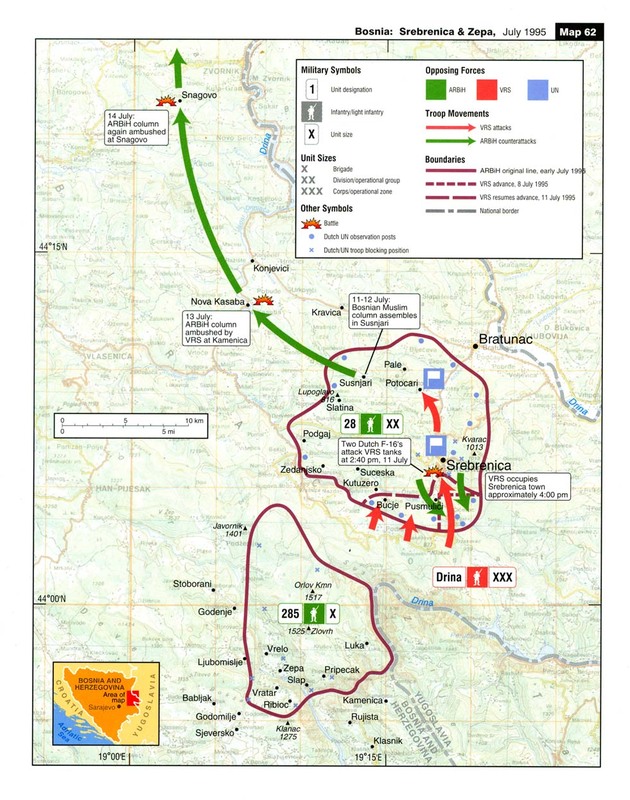 As described above by RPC of US Senate release this operational tactic of the Sarajevo regime’s Special Forces (AID) was designed to gain sympathy and invite NATO intervention on behalf of the Izetbegovic regime … and it was successful. In Balkans Srebrenica was not only case being part of bigger political came and fabricated manipulation; few years later the same tactic was implemented in Kosovo e.g with the Racak case was similar (More about this one may find from my article “High pressure to fabricate Racak reports“). After over decade it is still difficult in western media to admit that also Serbs were victims of war crimes – instead from year to year media repeats one sided picture about Serbs created mid 90s when US selected its side. 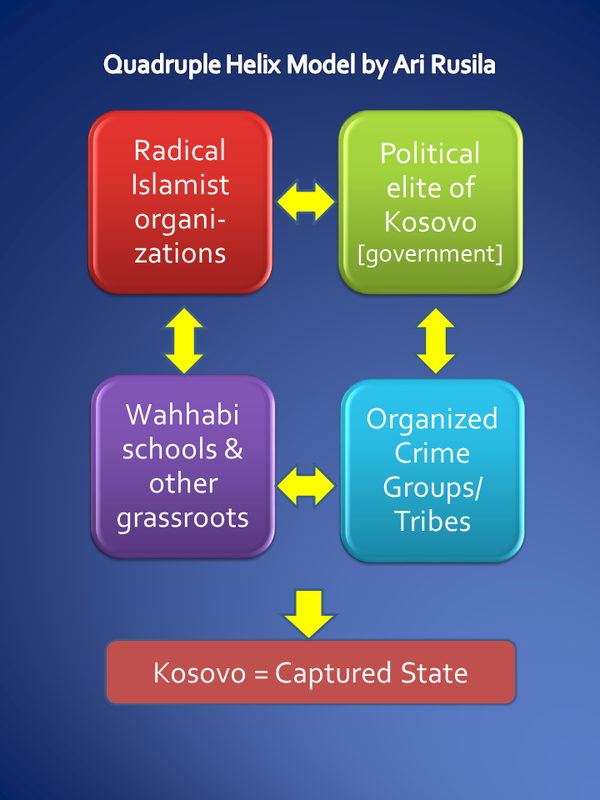 Also the same manipulated approach was later applied in Kosovo (Other side of story can be found e.g. from my article “Kosovo March/February: Pogrom with Prize” and “10th anniversary of Nato’s attack on Serbia“. What is amasing for me is how easy the mainstream media can be used for political manipulation. Srebrenica, the figure of 8,000 originated with September 1995 announcements by the International Committee of the Red Cross that it was seeking information about some 3,000 men reportedly detained as well as about some 5,000 who had fled to central Bosnia. Neither the Bosnian Serbs nor the Muslims were ever forthcoming with whatever information they had, and the “8,000” figure has tended ever since to be repeated as an established total of “Muslim men and boys executed by Serb forces”.Despite unprecedented efforts over the past ten years to recover bodies from the area around Srebrenica, less than 3,000 have been exhumed, and these include soldiers and others-Serb as well as Muslim-who died in the vicious combats that took place during three years of war. Only a fraction have been identified. The above map clearly explains why round 2,000 Srebrenica Muslims lost their lives. The decision that the 28th Muslim Division should refuse to lay down its arms and embark on a break-through along a 100km-long route in the hardest of military operations, for which it was not prepared in view of the prior retreat of command personnel, amounted to a conscious sacrifice of round two thousand Muslim men of military age. The Western allies would do their best to present it as no less than genocide. Both before and after Srebrenica lying about numbers killed was also standard practice, helpful in sustaining the dominant narrative. For Bosnia, in December 1992 the Bosnian Muslim government claimed 128,444 deaths of their forces and people, a number which grew to 200,000 by June 1993, rising to 250,000 in 1994. These figures were swallowed without a qualm by Western politicians, media, and intellectual war-campaigners, with Clinton himself using the 250,000 figure in a speech in November 1995. Former State Department official George Kenney has long questioned these figures and marveled at media gullibility in accepting these claims without the least interest in verification. His own estimate ran between 25,000 and 60,000. More recently, a study sponsored by the Norwegian government estimated the Bosnian war dead as 80,000, and one sponsored by the Hague Tribunal itself came up with a figure of 102,000 dead. Neither of these studies has been reported on in the U.S. media, which had regularly offered its readers/listeners the inflated numbers.A similar inflation process took place during the 78-day NATO bombing war in 1999, with high U.S. officials at various moments claiming 100,000, 250,000 and 500,000 Serb killings of Kosovo Albanians, along with the lavish use of the word “genocide” to describe Serb actions in Kosovo. This figure gradually shrank to 11,000, and has remained there despite the fact that only some 4,000 bodies were found in one of the most intense forensic searches in history, and with unknown numbers of those bodies combatants, Serbs, and civilian victims of U.S. bombing. But the 11,000 must be valid because the NATO governments and ICTY say it is, and Michael Ignatieff assured readers of the New York Times that “whether those 11,334 bodies will be found depends on whether the Serb military and the police removed them. The serial lying had been largely unchallenged in the mainstream, the demonization process and good-versus-evil dichotomy had been well established, the ICTY and UN leadership were closely following the agenda of the United States and its NATO allies, and the media were on board as co-belligerents. The Srebrenica events had a number of features that made it possible to claim 8,000 “men and boys” executed. One was the confusion and uncertainty about the fate of the fleeing Bosnian Muslim forces, some reaching Tuzla safely, some killed in the fighting, and some captured. The 8,000 figure was first provided by the Red Cross, based on their crude estimate that the BSA had captured 3,000 men and that 5,000 were reported “missing.” There are also lists of missing, but these lists are badly flawed, with duplications, individuals listed who had died before July 1995, who fled to avoid BSA service, or who registered to vote in 1997, and they include individuals who died in battle or reached safety or were captured and assumed a new existence elsewhere. But because of its key political role for the United States, Bosnian Muslims and Croats, and an almost religious ardour of belief in this claim, Sebrenica has been immune to evidence. From the beginning until today the number has been taken as a given, a higher truth, the questioning of which would show a lack of faith and very likely “apologetics” for the demon. This nice round number lives on today in the face of a failure to find the executed bodies and despite the absence of a single satellite photo showing executions, bodies, digging, or trucks transporting bodies for reburial. The media have played an important role in making the Srebrenica massacre a propaganda triumph. As noted earlier, the media had become a co-belligerent by 1991, and all standards of objectivity disappeared in their subservience to the pro-Bosnian Muslim and anti-Serb agenda. Why should people read articles challenging this massacre story? After all, it’s consistent with what one has been told: that Srebrenica was a safe haven where the UN was supposed to protect Muslims from supposedly murderous Serbs; that the Muslims, portrayed in the media as an oppressed group, were moderate and tolerant while the Serbs were supposedly fanatical Muslim-haters with a Hitlerian vision of a mono-ethnic state; that therefore it was no surprise that when the Serbs took Srebrenica, they supposedly killed thousands of Muslims as fast as they could. The number of Christians murdered in Sarajevo during the war by Muslim military and police, right under the noses of Western journalists, is at least in the many hundreds and probably in the low thousands. Between 1992 and 1995, some 1,300 Serb civilians were liquidated by Muslim troops based at Srebrenica; this was the precursor to the infamous July 1995 Serb offensive against that town. While Muslims were certainly expelled from their homes in large numbers, so were Croats (Catholics) and Serbs (Orthodox), but only Muslim victims and refugees were really considered newsworthy. Srebrenica – a hoax or massacre? I would say both; a hoax due the well planned and implemented PR maneuver , a massacre when the Serbs went to trap and used brutal force also against civilians. When the Serbs got a tactical win in warfare the Muslims got US as their strategic ally with Serb demonization. In addition to human sacrifice – victims from all ethnic groups, civilians and soldiers/mercenaries – one loser was the investigative journalism and media on the whole by accepting one-sided truth in Bosnia and since then also in future conflicts. One can have different opinions about bias of ICTY but from my point of view it offers so far best forum to get some answer to questions mentioned before when both prosecutor and defence have made their case. Anyway the statements of Mrs.Hartmann – as well the book of her former boss del Ponte describing e.g. organ trafficking (More e.g. in “War crime selected – organ harvesting from Serbs by KLA”) of Serb civil people by Albanian mafia – are giving quite disgusting picture about realpolitik behind noble statements of international community. Revolution in Iran seems to happen only in western dreams and media. Protests took place only in Tehran and a few large cities and are now nearly disappeared. Smaller towns and rural areas have been very quiet whole the time after elections. The opposition may not yet have been defeated, but the problems are much deeper than calming the streets. The struggle inside ruling elite is continuing and one could estimate that Iran’s political system is now undergoing a major crisis of legitimacy over allegations of a fraudulent presidential elections. So revolution is postponed in this still theocratic state. Iran is one of the oldest existing civilizations on globe, its population is well educated young and big and it owns huge energy resources so the country can have sustainable success also in future as regional superpower. From my point of view people in Iran know best how to develop their country without outside guidance – indeed foreign interference can only make situation worse as seen in history. However for foreign countries it is extremely important to try understand developments in Iran and consider their future cooperation according that background. From western perspective the key question is if foreign policy of Iran is changing and if to which direction. While U.S. and EU are still looking their positions related postelection situation in Iran the country itself appears to be caught between strategies: one that does not want to downgrade diplomatic relations with other nations for fear of international isolation, and another that is pushing the concept of foreign interference for domestic reasons. Tehran’s foreign policy, particularly its policies toward the U.S., has its own strategic logic, and is based on Iran’s ambitions and Tehran’s perception of what threatens them. Iranians are deeply skeptical about American motives in the Middle East. In 1953, the CIA, with cooperation with Intelligence Service, triggered a coup that deposed the popular Prime Minister Mohammad Mosaddeq, who had nationalised Iran’s oil industry, monopolised by the British. Mossadeq had wanted to nationalise the Anglo-Iranian Oil Company in which the British had a majority share. The British and Americans organised a coup, put Mossadeq under house arrest and placed Pahlavi firmly in control as Shah. Added to this are the insults and damages that the United States has inflicted on Iran over the past two-and-a-half decades. Iranians will never forget that the United States tilted toward Iraq in the Iran-Iraq war. By all accounts, Iran would have won the war if the United States had not interfered. Moreover, it is widely known that the United States provided poison gas and other chemical weapons to Iraq during that conflict. Legally the NED is a not-for-profit organization under US law, financed by an annual grant voted by Congress as part of the State Department budget. In order to operate, this organization is co-financed by the US Agency for International Development (USAID), which is part of the State Department. This legal structure is used jointly as a cover by the American CIA, the British MI6 and the Australian ASIS (and occasionally by Canadian and New Zealand secret services). 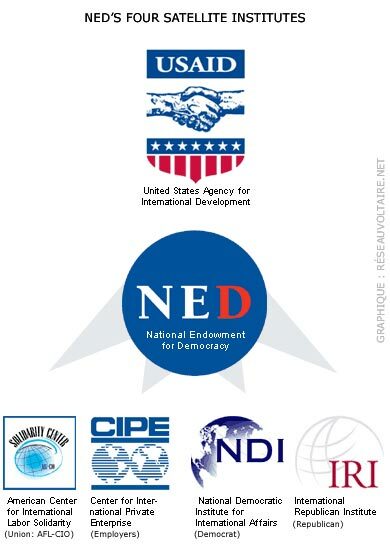 The NED presents itself as an agency promoting democracy. It intervenes either directly or using one of its four tentacles: one designed to subvert unions, the second responsible for corrupting management organizations, the third for left-wing parties and the fourth for right-wing parties. The operation conducted in 2009 in Iran belongs to the long list of pseudo revolutions. First, a 400 million dollar budget was voted in 2007 by Congress to orchestrate a « regime change » in Iran. This was in addition to the ad hoc budgets of the NED, the USAID, the CIA & Co. How this money is being used is unclear, but the three main recipients are the following: the Rafsanjani family, the Pahlavi family and the People’s Mujahedin of Iran. “Another is the presence in the UK of the Iranian opposition group MKO.” The MKO is the People’s Mujahedin Organisation, which was taken off the list of terrorist groups by the EU in January. The form of government would be a Constitutional Monarchy, with the Head of State being Reza Pahlavi, son of the former Shah, Mohammad Reza Pahlavi, who was deposed in the 1978-79 Islamic revolution, and Sohrab Sobhani as his Prime Minister. The Bush Administration apparently has a handpicked American “plumber” ready to go in Iran, much like Ahmed Chalabi (the leader of the Defence Department-backed Iraqi National Congress) in Iraq. This is Sohrab “Rob” Sobhani, an Iranian-American associated with the neoconservatives in Washington. With Reza Pahlavi as Shah, the 40-ish Sobhani would presumably be prime minister or president. The promoter of the Administration policy is American Enterprise Institute Freedom Chair Holder Michael Ledeen – one of four advisers in regular consultation with White House strategist, Karl Rove. ledeen and Sobhani recently established the Coalition for Democracy in Iran (CDI) to promote this regime change. Reza Pahlavi had been living quietly in Maryland until 11 September, when he began to address the Iranian community via the internet and satellite television. This prompted the Iranian community to dub him the “Internet Prince.” Rob Sobhani, who has known Reza Pahlavi since childhood, was actually born in Kansas. He became a specialist in energy policy. He has had his finger in many pies in Washington, including consultation on the construction of an oil and gas pipeline across Afghanistan. Sobhani’s interests in regime change are very clear and very consonant with American desires. They are largely commercial. Following his graduation from Georgetown, he became head of a Caspian Energy Consulting, a firm dealing with the transport and sale of Caspian oil. He also notes that supporting a secularisation of Iran would lead to easier transport of Caspian oil through Iranian territory. Sobhani also sees secularisation of Iran as beneficial for Israel. This is not surprising, since Israel and Iran had excellent ties before the 1978-79 Islamic Revolution. The Iranian Jewish community is the oldest continuous Jewish community in the world. The community is as prominent in Diaspora as in Iran, with members in powerful positions in the Israeli government and in American life, particularly in California. Elimination of the clerical regime in Iran would eliminate support for (the Iran-backed Lebanese) Hezbollah. It might even lead to renewed trade between Tehran and Tel Aviv. Ledeen and Sobhani expect to have the coup first, and then present Reza Pahlavi as the emergent ruler. Ledeen said as much in a rally in Los Angeles for Iranian monarchists, saying in effect: Let’s have the revolution first, then worry about who will rule Iran. What Ledeen, who has never traveled to Iran, and Sobhani don’t understand is that for such an operation to work, it cannot be tied to an overt embracing of a restoration of the Monarchy (remembering the CIA engineered counter-coup in 1953 that created an American puppet regime in Iran until 1979). Moreover, it cannot specifically espouse use of the Mojahedeen Khalq Organisation (MKO), the guerrilla movement opposing the Iranian government from Iraq. Both the Pahlavi regime and the Mojahedeen are widely opposed in Iran, even from people who would like to see clerical rule eliminated. To have Reza Pahlavi return to power with American blessing would, for many Iranians, be a continuation of American interference in Iranian affairs. Change in foreign policy – western view? Israeli leaders have not asked the United States for approval to attack Iran for fear Washington will turn them down, according to a news report on July 7, 2009 in The Washington Times. Two unnamed Israeli officials close to Benjamin Netanyahu said the prime minister is concerned the White House would not approve an Israeli request to launch military strikes on Iran’s nuclear program. “There was a decision not to press this because it was probably inadequate for the engagement policy and what we know about Obama’s approach to Iran,” one of the officials told the Washington Times. There are some who believe Bush’s mistake was not to have shifted his aim eastward: that if he was looking for an oil-rich state in the Persian Gulf with links to terrorism and dreams of weapons of mass destruction then Iran, not Iraq, should have been his target. That kind of talk makes others nervous. They fear that the US might one day repeat the Iraq calamity, with the ayatollahs cast in the role of Saddam Hussein. Russian President Dmitry Medvedev said Sunday that Moscow supports US Administration’s plan to hold direct talks with Iran.Medvedev told reporters that the talks would prepare ground for US to discuss its concerns. As mentioned earlier privatization of energy sector and transportation routes were a priority in US blueprint “restore Monarchy”. Also during the last electoral campaign, Rafsanjani required Mir-Hossain Mousavani, his former adversary, to promise he would privatize the oil sector. “ Color revolutions” are to revolutions what Canada Dry is to beer. They look like the real thing, but they lack the flavor. They are regime changes which appear to be revolutions because they mobilize huge segments of the population but are more akin to takeovers, because they do not aim at changing social structures. Instead they aspire to replace an elite with another, in order to carry out pro-American economic and foreign policies. The “green revolution” in Tehran is the latest example of this trend. Behind the soothing rhetoric of “the promotion of democracy”, Washington’s actions aim to impose regimes that are opening their markets to the US without conditions and which are aligning themselves to their foreign policy. However, while these goals are known by the leaders of the “color revolutions”, they are never discussed and accepted by the mobilized demonstrators. In the event when these takeovers succeed, citizens soon rebel against the new policies imposed on them, even if it is too late to turn back. Besides, how can opposition groups who sold their country to foreign interests behind their populations’ backs be considered “democratic”? When post-election riots started the Western media relied on its reporters covering the mass demonstrations of opposition supporters, ignoring and downplaying the huge turnout for Ahmadinejad. Worse still, the Western media ignored the class composition of the competing demonstrations – the fact that the Ahmadinejad was drawing his support from the far more numerous poor working class, peasant, artisan and public employee sectors while the bulk of the opposition demonstrators was drawn from the upper and middle class students, business and professional class. The most news coverage came from Tehran via English speaking students ignoring the provinces, small and medium size cities and villages where Ahmadinejad has his mass base of support (more in pre-election survey). While the opposition’s supporters were students easily mobilized for street activities Ahmadinejad’s support drew on the majority of working youth and household women workers who would express their views at the ballot box and had little time or inclination to engage in street politics. Ahmadinejad did very well in the oil and chemical producing provinces. This may reflect energy sector workers’ opposition to the reformist plans privatize public enterprises. The great majority of voters for the incumbent probably felt that national security interests, the integrity of the country and the social welfare system, with all of its faults and excesses, could be better defended and improved with Ahmadinejad than with upper-class technocrats supported by Western-oriented privileged youth who prize individual life styles over community values and solidarity. Unless there is a fundamental change in the existing structural configuration of the Islamic Republic, or in a change in the institution of the Supreme Leader, it is unlikely that Iran will radically change its foreign policy. If anything, the next president of Iran is likely to rely increasingly on nationalistic sentiments in order to bring harmony to a divided, dynamic and assertive Iranian electorate. The Islamic Constitution was deliberately structured to insure that the unelected component of the government, or its Islamic part, dominates its elected or the republican part. Tehran’s top priority is the survival of the Islamic Republic as it exists now. The strategic direction of the Islamic Republic of Iran has always been determined by the Supreme Leader, in consultation with the main centers of power in Iran’s highly factionalized polity. As the second most powerful man in the country, the Iranian president has profound impact on strategy and policy, but the Supreme Leader — Ayatollah Ali Khamenei — is the final “decider.” As the country’s most powerful figure, he is the commander of the armed forces and in charge of the intelligence and security forces and serves for life. He — not the president — makes the key decisions regarding war and peace, Iran’s nuclear policies, and relations with Washington. The Islamic Constitution was deliberately structured to insure that the unelected component of the government, or its Islamic part, dominates its elected or the republican part. One aspect that something is changing inside Iran’s power structure is that the opponents of new elite is making mass-scale money transfers from Iran. European security experts, speaking on the condition of anonymity because they were not authorized to discuss the matter publicly, confirmed reports in Italian and Turkish newspapers that large sums of money had been sent to havens outside the country from banks controlled by the Revolutionary Guards. Ahmadinejad’s success in last election is strenghtening a process begun in June 2005, with his first election as president. Slowly he is making power swift from clerics of Qom to the Iranian Revolutionary Guards Corps (IRGC), particularly the veterans of the Iran-Iraq war. Revolutionary Guards have seized ownership of Iranian revolution from the clerics, whom they accused of being weak-willed opportunists and corrupted hypocrites. However under Ahmadinejad I see that we have a president who will not take insults from anyone or any country, this makes me and millions of other Iranians very happy. I have no doubt, he also did an excellent job standing up to the world war criminals, thieves, liars and hypocrites. My only dilemma is accepting the way ordinary citizens & protestors on the streets were treated. Soon, Iran will fade from the news cycle and its horrors will blend with those of the rest of the world. 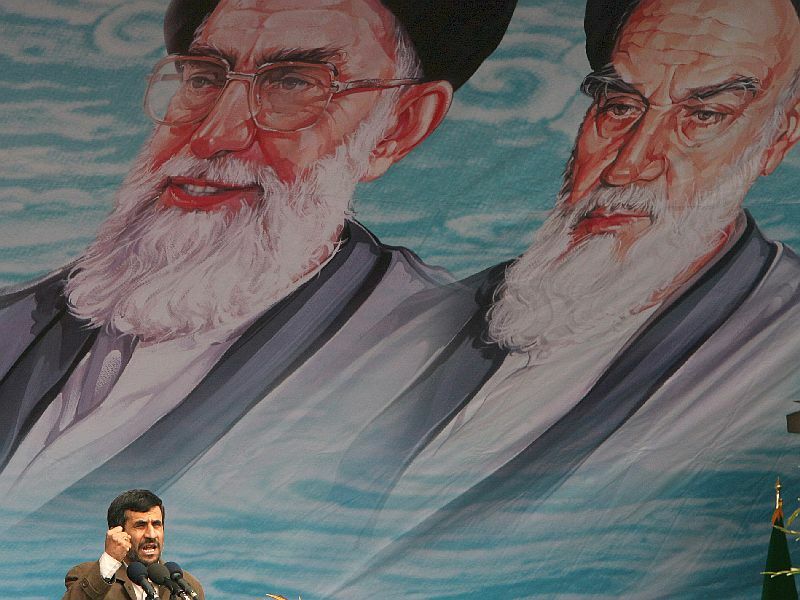 Ahmadinejad will serve four years as a lame-duck president, tempered by Khamenei domestically and internationally. Mousavi, along with Khatami, will probably retire from politics while Rafsanjani secures his assets as quickly as possible. (Ali) Larijani (Parliament Speaker) will be the supreme leader’s new man and after leading the charge on election reform will probably be the next president. Professor Ali Ansari, a noted authority on the country, predicts that a regime that now “suffers from a serious domestic legitimacy problem – and which knows it – will seek a foreign foe, something to rally the country around.” He predicts “acts of provocation”, and only hopes Israel is wise enough not to take the bait. The worst thing for foreign powers – excluding Israel’s airstrike and all its consequences – is to come out in open support of opposition demonstrations – as the Bush administration did so recklessly in 2003, forcing reformist leaders and opposition politicians to shun protesters for fear of being denounced as traitors. Same action today would be fatal for Mousavi and the current Iranian opposition. The best thing the United States and EU could do is to re-establish diplomatic relations with Iran, get involved with commercial dealings, and give the Iranians some reason to undertake reforms ­ a better life in partnership with the West. From other side Russia has long-term interests in Central Eurasia and with Iran it will continue to implement large-scale economic projects so Iran’s partnership with Russia can also create economical base for Iran’s reforms. In time, the younger generation, which makes up more than 75 percent of the population, will take over the system which now is on developing stage. 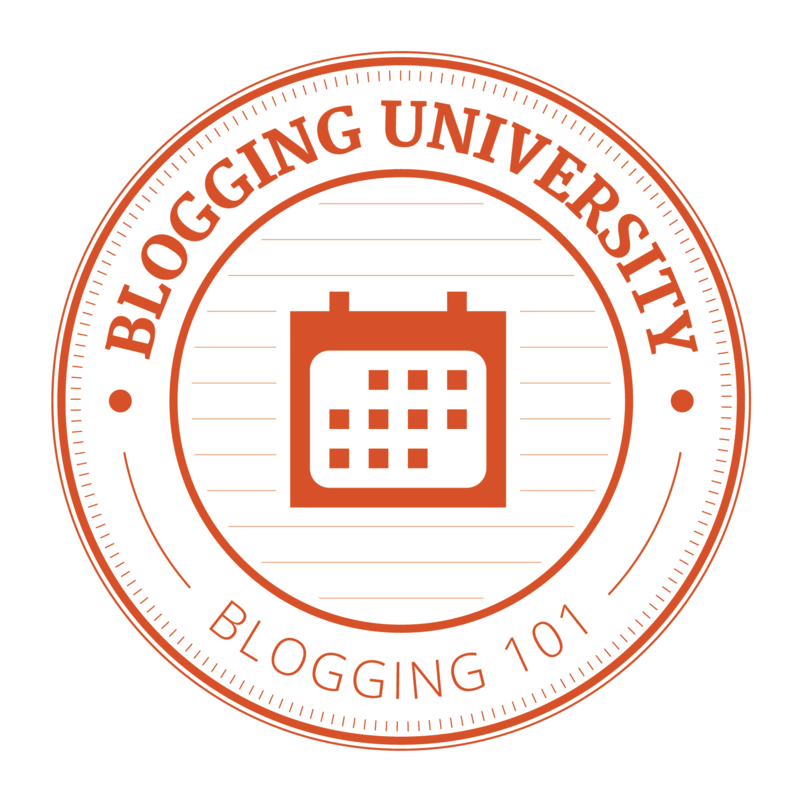 You are currently browsing the Conflicts by Ari Rusila blog archives for July, 2009.